In anticipation of our opening weekend, we wanted to introduce the folks who are putting together Alice with a short n’ sweet interview. Chapter 1 of Alice is an art installation wherein about 10 different local artists were asked to create their interpretation of the first chapter of Alice in Wonderland using their own unique style. Today, our blog focus is on one of those Chapter 1 artists: Ben Blount. Ben Blount was born and raised in Detroit. 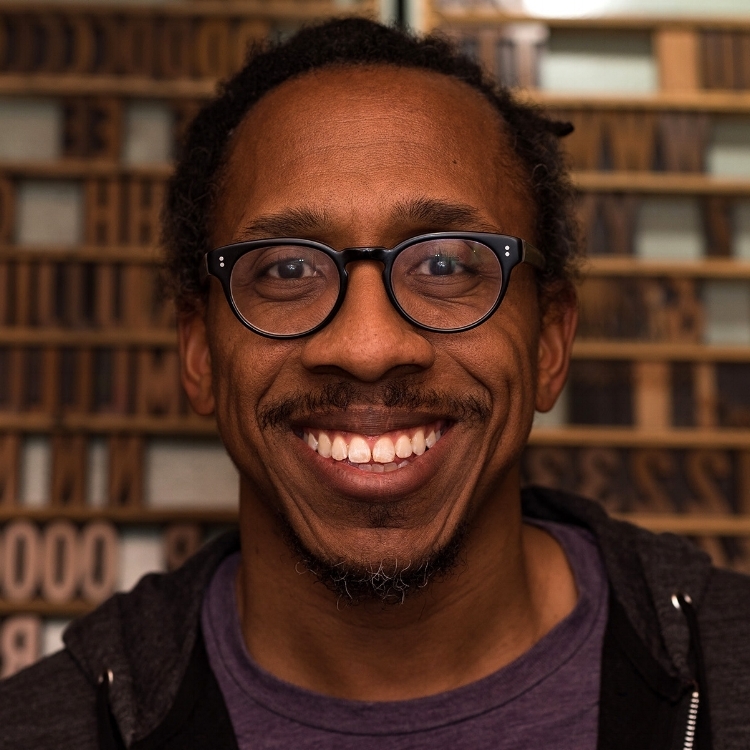 He is a designer and letterpress printer who loves type and putting ink on paper. Sometimes he turns what he prints into books. His work explores questions and race and identity and the stories we tell ourselves about living in America. Truth-tellers and rabble-rousers in all areas of popular culture inspire his work—from Dave Chapelle and Kara Walker to Mos Def and Amos Kennedy. He learned a lot about design at Washington University in St. Louis, a lot about printing at Columbia College Chicago, and filled in the gaps with mentors and lots of practice. What part of Chapter 1 inspired your piece? Almost the last line of the chapter. Alice had so many strange and interesting things happen to her that she was surprised and disappointed that nothing wondrous happened when she first tasted the tiny cake. I related it to our tendency to take life for granted and get stuck in the everyday and mundane. I see it as the call to take a trip down the rabbit hole. In the studio. Either making something or collaborating or teaching. Being around creative people, making stuff. Come and see Ben’s piece entitled: “Ask Alice” in Chapter 1 of Alice www.brownpapertickets.com/event/3565892 and check out Ben’s work at www.benblount.com.